Many of the pre-oil Ajami, Baloch, East African and Indian influences on the local cultures in the Gulf have become part of everyday life. For hundreds of years, the Gulf has had a transnational population, and local cultures are so intermingled with their Indian Ocean neighbours that it is difficult to pinpoint whether some Gulf families are Persianised Arabs or Arabised Persians. Words of Persian and Indian origin are used daily in the Gulf’s khaleeji dialect of Arabic by citizens of all ethnic groups. Many of the original pearl divers were East African, and traditional Arab seafaring songs are actually African-inspired. However, awareness of this intermixing and cultural hybridity is often dismissed in narratives that promote a ‘pure’ Arab history, culture and present. Researchers have documented the ways in which the ethnic diversity in the Gulf has been officially sidelined in favour of a narrative centred around Bedouin heritage. In these state depictions, there is often scant reference to the transnational local society nor the residents who played significant roles in the region’s economy before the oil boom, such as the Indians who controlled a large part of the gold market and who acted as the region’s creditors before the introduction of formal banks. Although these depictions of culture and history have often been tied to the creation of the modern Gulf states and a way for the monarchies to legitimise the status quo, rarely has there ever been a discussion of the legacy that Arab nationalism created in promoting a monolithic notion of Arab ‘purity’. 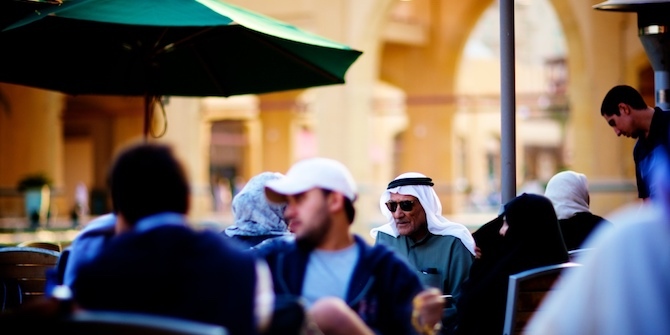 This discussion is important for a more nuanced understanding of Gulf identity today. The population inhabiting [Syria, Iraq and the desert regions between them] is made up of Arabic-speaking communities who had reached different stages of development, those occupying… the coastal regions of the Mediterranean seaboard and the lower basins of the Tigris and the Euphrates… being intellectually more advanced and politically more developed than those, mainly nomadic, who lived in the inland regions. While there were different strands of Arab nationalism with diverging opinions, many promoted the idea of one Arab nation with a one shared (and often homogenous) Arab history and culture. Through these depictions, a monolithic and pure ‘Arabness’ was often promoted. One example in the Gulf was the way Kuwaiti Arab nationalists referred to the Kuwaiti Ajam (or Kuwaitis of Persian origin). During the 1950s, a time of increased tension between Iran and Kuwait, the latter’s Arab nationalists viewed not just new waves of Persian immigrants as a threat, warning that Iran had designs on Kuwait just as it had in Bahrain, but also targeted the Ajami minority, despite their community’s existence long predating these issues. According to F.A. Al-Mdairis, Kuwaiti Arab nationalists sought to revoke the citizenship of the Ajam, and also petitioned for the exclusion from the census those who ‘were not proud of Arab history’, who did not ‘believe in the Arab nation’, or who had ties to any foreign country. Ajami Kuwaitis were described as ‘those who immigrated to Kuwait long ago and have Kuwaiti citizenship, but despite this, feel no loyalty for this Arab country’. Similar language fills the pages of Al Iman magazine, another Kuwaiti Arab nationalist magazine published in the 1950s. And just as the presence of foreign residents is often depicted as a threat to khaleeji culture and identity today; so too were the Ajam in Kuwait, who were described as ‘filthy’ and criticised for their lack of Arabic, or its improper usage. In another article in Al Iman, the author discusses what he considers to be the problem of employing Indians instead of Arabs. He argues that Indians are completely foreign to Kuwait, and as such priority should instead be given to the Arabs of the Levant and North Africa. This is despite the fact that Indians played a huge role in Kuwait’s economy and society historically. In arguments like this, Indian Ocean connections are dismissed, ignored and marginalised. The newer connections with the Arab world, instead, are portrayed as historical and everlasting. And what any Arab, who believes in the unity of Arabs, should know, is that the inhabitants of North Sudan are Arabs who immigrated to the land at different points in history… And it was natural that their blood would mix with those of the zinooj, the inhabitants of the lands. But this pure Arab blood always refuses to disappear in other blood, rather it remains and prevails… even as generations pass. And the Arabs of the Sudan – even with the passage of time – continue to have the good characteristics that the [Arab] ancestors left them with. They held onto their Arabic dialect until it completely overtook the other languages, except in a few regions which the Arabic language shares with other older languages (Ahmad Abu Bakr Ibrahim, 1953: 159). The decline of indigenous, non-Arab languages is not mourned, but rather celebrated by the author. While sympathisers with the movement often look back nostalgically at leftist Arab nationalist groups as progressive, the reality is that prejudice and the marginalisation of ethnic, linguistic and cultural diversity was at times a proud feature of these movements.